New Year’s Eve is a fabulous date for a wedding. Guests are usually in the middle of a vacation, relaxed and ready to celebrate. It’s also a great excuse to indulge in your fondness for glam and sequins. 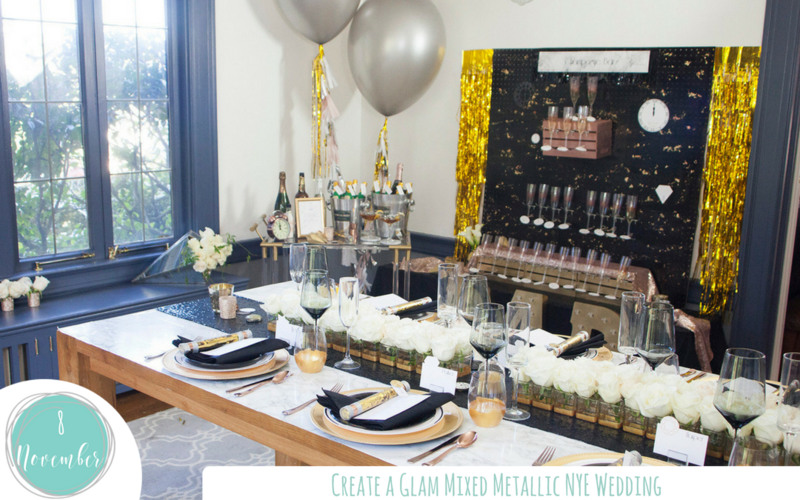 This mixed metallic New Years Eve wedding will meet all of your glitter and sparkle needs. You’ll find all the details to create the stunning backdrops, table settings, bar and the photo booth that make up this Mix Metallic New Year’s Eve Wedding here. As an OTC blogger, I received compensation and/or products in exchange for my styling and crafting services. As always, all project ideas and any opinions expressed here are my own. For further information on our disclosure policy please check out our disclosure page. Fun details tie in the New Year to the couple’s new life together. Individual confetti at each place setting, vintage timepieces and of course, Champagne! You’ll also find elegant centerpieces that are contrast perfectly with the glitz and glam. Guestbooks are another wonderful way to capture memories of the wedding day. Tie into New Year’s Eve by capturing resolutions. All the gorgeous details and cards by Elena of Worldwide Party are available on Fun365. Look for our New Year’s Eve Signature Countdown Cocktail and our fresh take on the traditional champagne tower. A DIY Champagne Wall, your guests can refresh their champagne from to toast the happy couple and ring in the New Year. Make sure you capture every moment of your New Years Eve Wedding in front of our DIY Metallic Fringe Photo Booth, it will help everyone remember the fabulous time they have celebrating! Wink, wink! Get all the stunning details of this ultra glam and ultra-affordable Mix Metallic NYE New Year’s Eve Wedding. You can see it, shop it and make it with the click of a button!